A multimillion-dollar plan to advance the cause of equity, inclusion, and diversity is underway at American University. More than $121 million is being invested to implement goals set out in the Plan for Inclusive Excellence through FY 2019. The plan’s first phase budgets $53 million in spending on institutional scholarships like Pell Grants, Frederick Douglass Distinguished Scholars, the Yellow Ribbon Program for veterans, and graduate student scholarships aimed at increasing diversity and access across the institution. 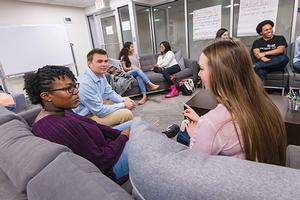 The plan designates an additional $7 million in year-one funds for academic initiatives such as the American University Experience Courses (AUx), academic centers, faculty development, curricular enhancements, and other support services and programs to advance access, equity, and inclusion. A further $61 million is earmarked for investments in diversity, equity, and inclusion programs in year two. University leadership is committed to ensuring that financial resources are properly aligned to support the goals outlined in this plan and, during the coming year, will assess additional needs in time for the next biennial budget process. “American University can thrive only when we affirm the dignity of everyone, when we demonstrate cultural competence, and when all members of our community—especially students, faculty, and staff of color—feel included,” President Burwell said in her inauguration speech. The Plan for Inclusive Excellence touches all parts of and all people at the university. It addresses the student experience inside and outside the classroom; faculty and staff recruitment, hiring, promotion, and retention; the handling of incidents of bias and discrimination claims; communication around issues of diversity, equity, and inclusion; and much more. One goal of the plan is to equip members of the AU community to lead change in a complex world. As part of this goal, AU is implementing institution-wide training initiatives, tailored to the needs of campus constituencies and focused on cultural competence as a critical aspect of orientation, learning, onboarding, and professional development. Another goal is to focus on campus climate and culture so that all members feel that they belong. The university is providing grant incentives to encourage collaboration across departments and student organizations to develop innovative diversity and inclusion programs, foster a sense of community, and positively impact campus climate. Changing AU’s systems, policies, and procedures to promote diversity, inclusion, transparency, and accountability is a critical plan goal. Objectives include adopting consistent hiring policies and practices across the university to advance equitable outcomes. Access and equity in the way AU recruits, hires, trains, develops, evaluates, and recognizes faculty, staff, and administrators are also a goal. AU will pilot a training program for faculty hiring, reappointment, and promotion review committees. It will focus on recognizing and eliminating bias in recruitment and promotion processes. University leadership has worked with the Office of Institutional Research and Assessment to develop a set of metrics by which to drive and assess the progress of the plan. Among the key measures is an improved campus climate that provides a sense of belonging and community for all its members, as evidenced in surveys and focus groups. Other measures are an increase in compositional diversity among faculty, students, staff, and administrators, and the successful completion of trainings or course work by members of the community. Student success is measured by indicators like retention and graduation rates of underrepresented populations. President Sylvia M. Burwell announces American University’s Plan for Inclusive Excellence and discusses the opportunities and challenges the university faces with respect to diversity, equity, and inclusion.